We sell a full range of paddock cleaners with fast UK delivery, usually the next day or if not within 48 hours. 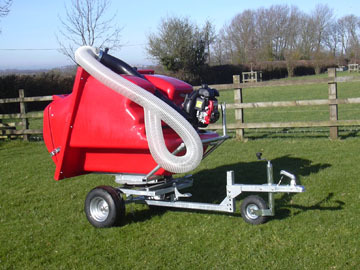 All our paddock cleaners are manufactured in the UK and are one of the most popular vacuums in the marketplace. Each model performs the same job at the same rate, the only difference is the volume of the container. They are simple to operate and easy to start, the petrol engine creates a vacuum in the container to offer powerful suction through the 5" hose. Our vacs come with a 2 year warranty, 5 years on the bin. They are reliable and easy to use with minimum maintenance, tried and tested over several years and have an excellent reputation. 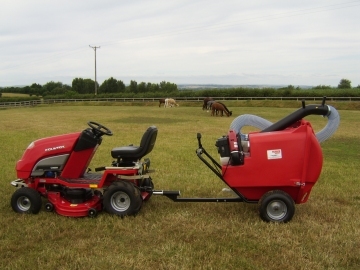 The paddock cleaners we sell come with a Honda™ engine and are very easy to start. They are supplied with a strong and durable plastic bin so no rust and easy to empty. 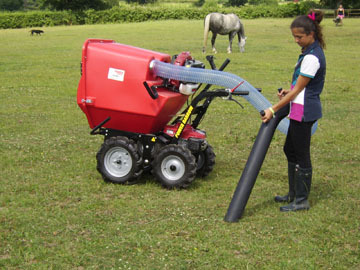 The 'Clean Fan' system is used where the vacuum is created in the bin so the muck does not go through any moving parts. 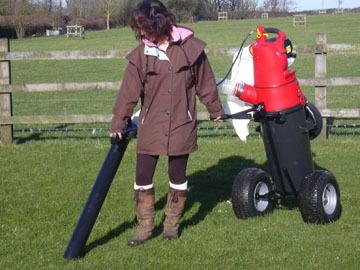 Models included in the range are handheld paddock cleaners, towable and also self propelled vacs. To buy or if you need any help choosing, please just give us a call on 01458 850 084, we'll be more than happy to help you and ensure you have the best type of paddock cleaner for your needs. 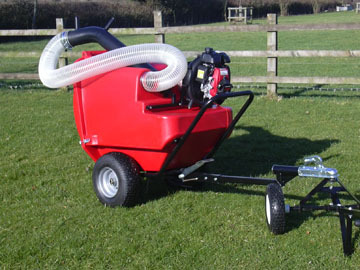 The most compact trolley mounted paddock vac available, designed for towing by hand and powered by a Honda™ petrol engine. 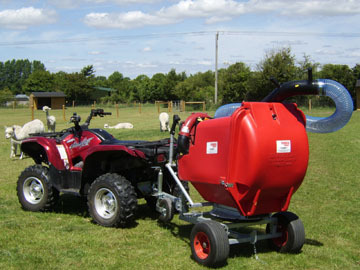 With a 360 litre capacity bin, this is the most popular towable paddock cleaner model but it can also be pulled by hand or a vehicle with a trailer dolly. Similar to the PC500 Plus paddock vacuum with the added advantage of a 360° swivel body. This extremely robust Trafalgar model is the largest paddock vacuum available with a 720 litre capacity. The same size as the PC1000 vac but with the added advantage of a 360° swivel body. 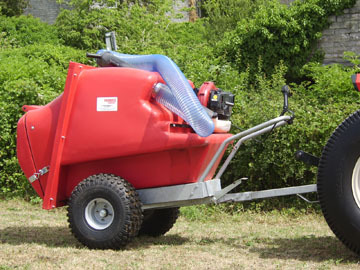 This 340 litre capacity paddock cleaner model is a 4-wheel drive self propelled machine allowing you to use this vac without a towing vehicle. For paddock vacuum sales, if you have any questions regarding your choice of paddock cleaner or you would like some advice, please call us on 01458 850 084 or alternatively email sales@paddockvacuumcleaners.co.uk and we will be more than happy to help you.